Firstly, thank you, Valerie for another detailed and well-argued analysis. I too like to dwell on reports for some time before coming to a conclusion. I have tweeted about Rose and linked to various commentaries upon it and even highlighted some memorable soundbites from it but until now haven’t made up my mind about it. Your piece has helped me to put my thoughts in order and draw out my position. When I first read the Rose Review what struck me was its almost polemical language, so different from the weasel words which most committee reports come out with. He really was hard hitting and for once didn’t settle on just one target but many. From the historic poor quality of line management to the degree of interventions and disempowerment emanating from Whitehall, he judged us all and found many wanting. Like you, I found this approach refreshing and exciting. Yes, he got it. But again like you I found the remedies he proposes to be nugatory. He diagnosed our problems well but prescribed the wrong medicine. I particularly like your suggestions for a new approach to developing leaders and followers, a subject dear to my heart. I think the 30% vacancy rate at acute CEO level speaks more eloquently of the failure of the” hero leader” than anything I can say. We need a new kind of leader, ones who’re skilled at supporting others and encouraging performance management throughout the organisation. We have enough confident decision makers. They’re what have got us where we are now. If we want to manage health and social care better in the future we need to try something different. I think the Leadership Academy has got this too, although followership seems to be a way off their agenda. 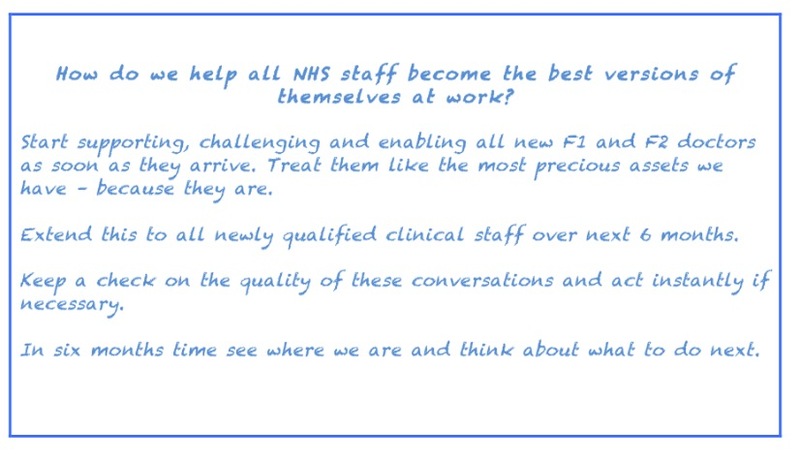 Your final proposal, to harness the power of the new professionals at the start of their careers should be a clarion call to all interested in culture change in the NHS. I hear that 160,000 people are studying to be part of our future health care workforce, mostly within the NHS. They should be the focus of our attention. Rather than see how quickly we can institutionalise them, we should be helping them to help us be different. In particular, we should aim to create in them the absolute demand for better support, better performance management and better leadership from the organisation. If we want to crack the “going over to the dark side” thing we need to catch people early. Help them see how integral to being a great professional being comfortable managing and following and leading is. Well done, Valerie, your back of the envelop prescription is worth a go.